We are back home, we returned on Saturday July 13. 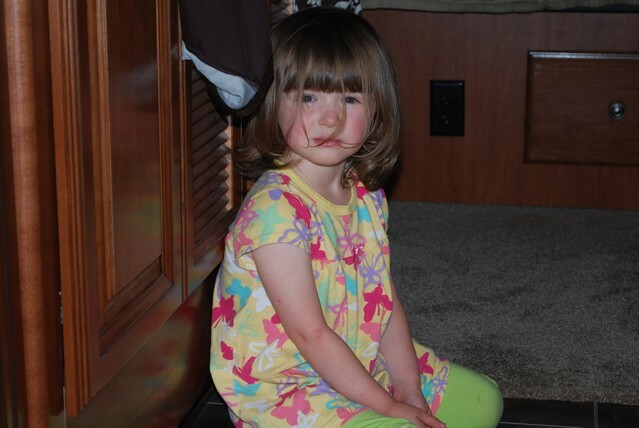 We have been relaxing and unpacking the RV (slowly because of the very hot weather!). We enjoyed the trip but we also enjoy the summers at home with our neighbours. Everything worked well in the new trailer but we will make some changes to where stuff goes, it's nice to take a shorter run and find what fits in each cupboard and what should be placed in a better location. There are also a couple of adjustments to be made (under warranty) to the trailer, this will be done as the fall approaches. We did just over 5,500 km. on the trip and the mileage was 12.8 IMP MPG, 0.3 MPG lower with the new trailer compared to the Titanium last year. This difference could partially be caused by some differences in winds on the trip north but it probably is indicative of the heavier trailer weight and the fact that we were carrying a full load of water (100 gallons) on some of the trip legs. Not a significant mileage difference. We look forward to the next outing with the RV! 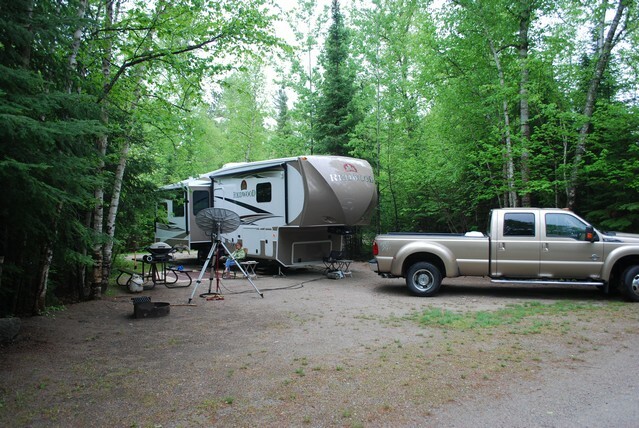 We are in the Serpent River Campground near the intersection of highway 17 and the road to Elliott Lake (I think it's hwy 108). We decided to stop here at this former KOA as we wanted to get a full service campsite that is more open than the ones at Chutes. A local doctor's son is getting married this weekend so there are a lot of guests here for the wedding, we got the last water/hydro site in the park, it's still more open than at Chutes. 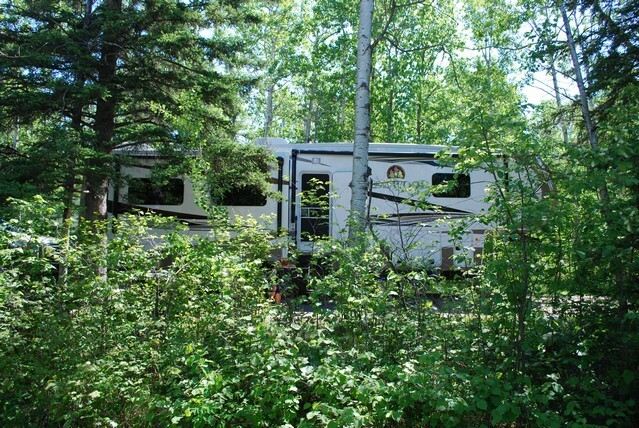 Last evening we stopped at Rabbit Blanket (campsite 27), the RV squeezed in but we were in the trees (no internet). We are heading home quickly, we should be back home tomorrow. 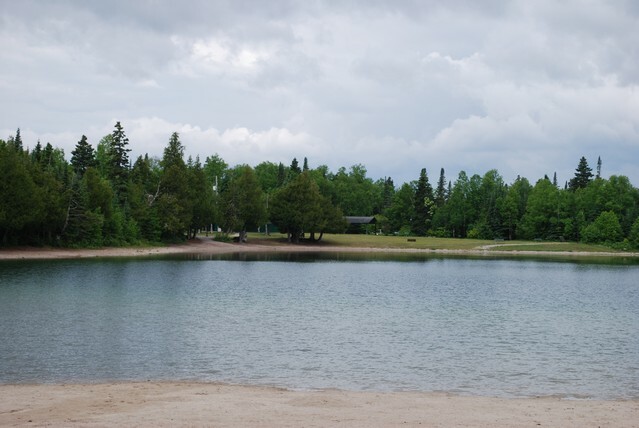 We are in Penn Lake park in Marathon, we've been here since yesterday afternoon. 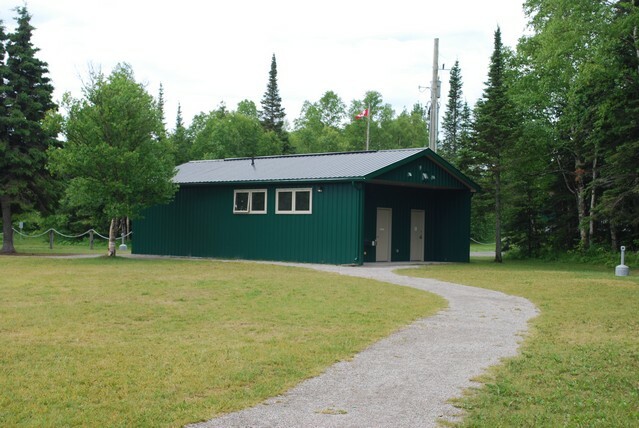 The pull through campsites in Neys PP were full and Pukaskwa isn't really where we like to stay, so we booked a campsite here through the Town of Marathon. 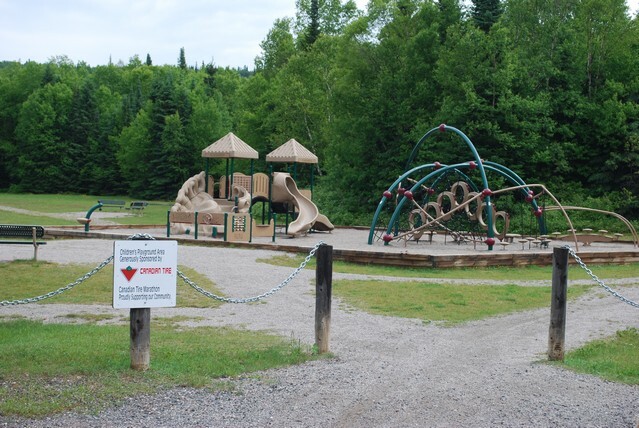 This is a beautiful little park that's undiscovered by campers.We understand that it was substantially upgraded about 5 years ago, it has two sites with 50/30/15amp service and 16 with 30/15 amp service and there also are a number of tent sites. The full service sites have water and sewer and the wifi is excellent (more on that later!). Presently there are 4 or 5 construction workers here for the longer term and a couple of overnighters came is last evening and left this morning, otherwise the park is empty. The gentleman that owns the M&M meat shop in town thinks that the reason the park is empty is that no one knows about it! The town is to be congratulated on the work done with other levels of goverenment and the private sector to develop this park. We are enjoying this stop, it's within walking distance of shopping (including an A&W!!). We will be back next year. When I mentioned the wifi above, I'm using it now to post this entry, the Hughes internet has been giving issues, it looks like our satellite assignment has been changed (for the second time in a week!!) and I can't get a receive signal to aim the dish (which also means no Shaw satellite TV!). In addition, our GPS unit locked up, we don't really need it to get home but it gives arrival times and turns so we miss it. As a final challenge, the power plug on the laptop shorted out (too much pulling on it), a trip to the local Canadian Tire (partially to return the patronage for the nice children's park here!) resulted in a purchase of a soldering gun to do a temporary repair. Lots of technical challenges! Depending on whether the satellite assignment change can be sorted out or not, this may be the last post until we get home next week. The service support from Galaxy Broadband has been underwhelming to say the least! 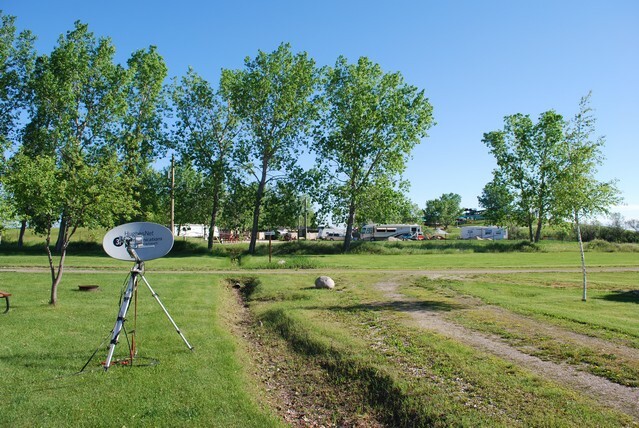 An update, we are back on-line after moving the dish (darn tree in the way!) so will be ableto update our location as we head south. 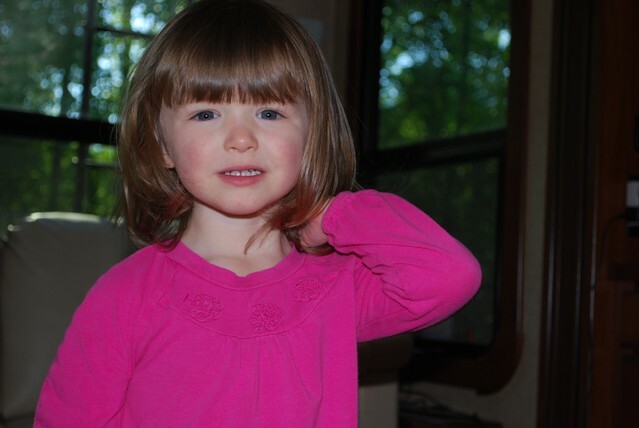 We are back in our usual haunt at the Thunder Bay KOA. 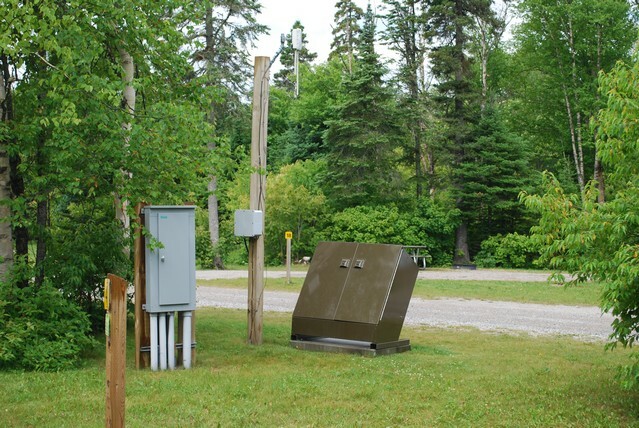 We reserved a back-in site that is more convenient for hooking up the 50 amp service and we are enjoying the stay. The weather improved today, we've got sun and warmth. We arrived yesterday and shopping and laundry were done today. As usual we didn't have the camera in the truck when we saw a beautiful wolf on the trans Canada on the way here yesterday, darn! It's off to Marathon tomorrow. We are back here in site 14 for the weekend. It's been Florida weather, high temps with high humidity and we had some afternoon rain and thunder. We got half of a camp fire before the showers came back. It's nice to run the A/C to take the humidity out of the trailer. 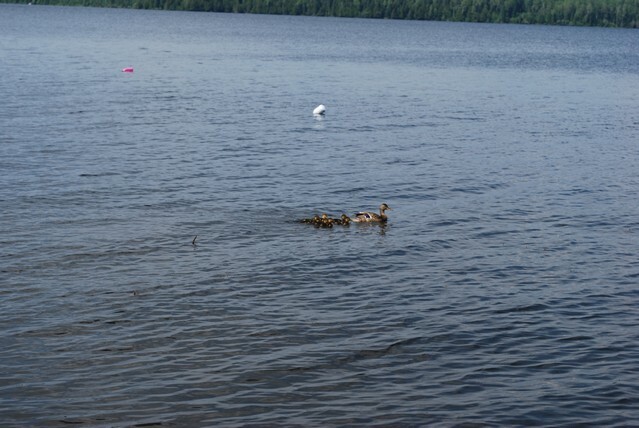 There were other swimmers around, this mother and 6 ducklings went by the dock! Basking in the good weather! We are in our daughter and son-in-law's place near Ear Falls again, enjoying the great sunny warm weather. 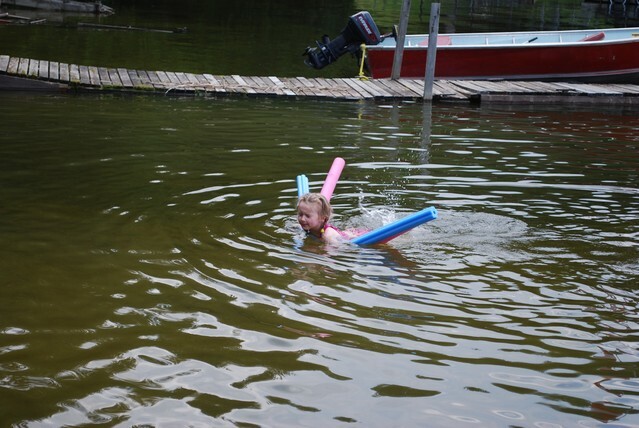 At this time it's 29C inside and outside the camper and it's been like that since we arrived here on Tuesday after we spent Monday in Vermilion Bay. The lake was almost glass smooth! 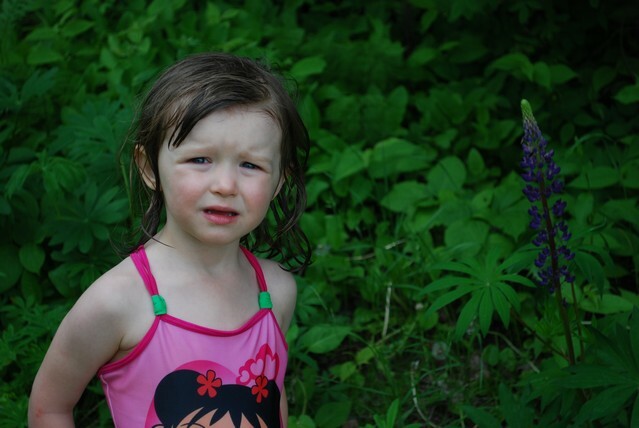 Swimming with the help of the "noodles"
Kate beside some nice wild flowers! We are enjoying the visit, more pictures later! We are back in Travelers in Winnipeg, Al has been lax in posting as we've been here since Friday afternoon. Tonight is our last night here, we will be in Ontario tomorrow. It's been hot and dry here since we arrived, not sure if east Winnipeg got less rain than in Riding Mountain but the sun is welcome. 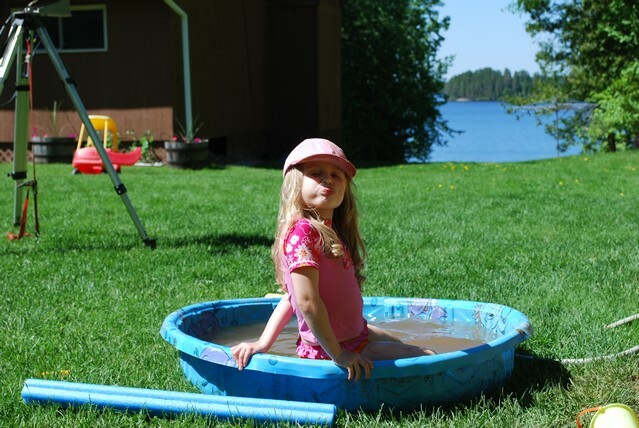 It's warm enough that we may turn on the A/C for a while this evening.The water park next door is full of customers all enjoying the weather, you can smell the sun block here in the campground! 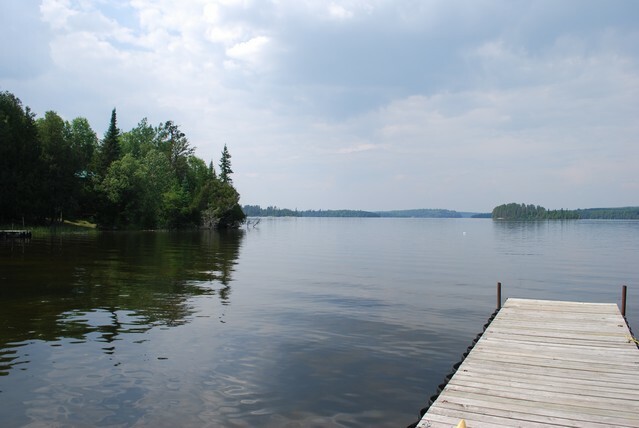 It's off to Vermilion Bay tomorrow! Anyone got an Ark to rent?? We are heading towards the end of our stay here at Riding Mountain. 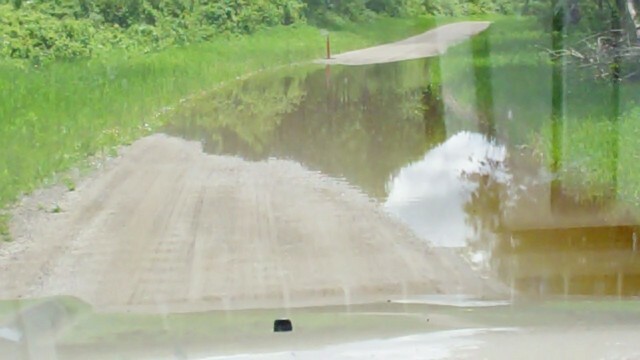 We've had some interesting weather, most days have been sunny but there have been severe thunderstorm/heavy rainfall warnings almost every day. We've had campfires almost every day but the rain has come after suppertime. We don't get local rainfall amounts here but in the surrounding areas there have been two days with 100 mm of rain. 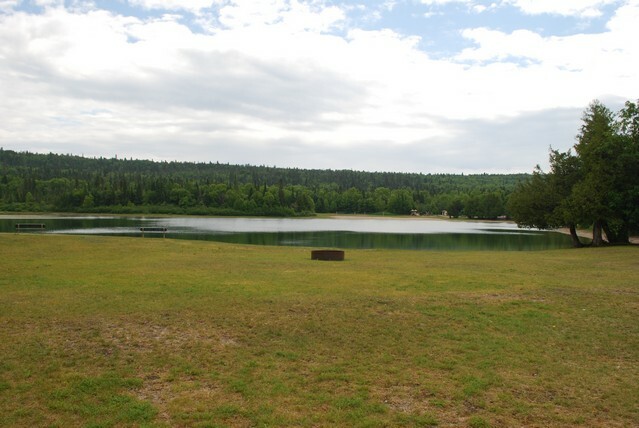 The campsites at the bottom of the hill here have been under water and the park staff has brought in loaders and fill to prepare the sites for the weekend where all sites have been booked. 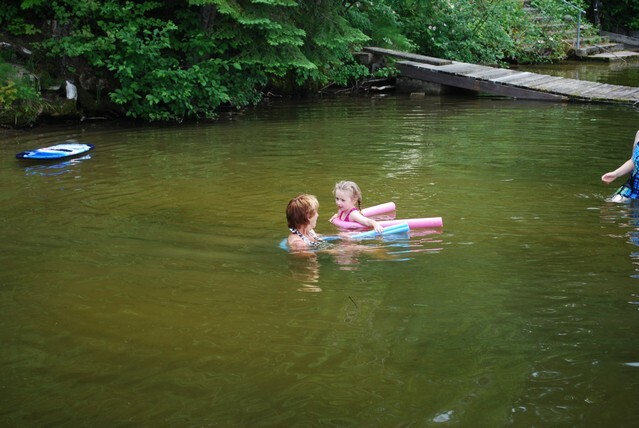 Not deep water but you need to be careful! 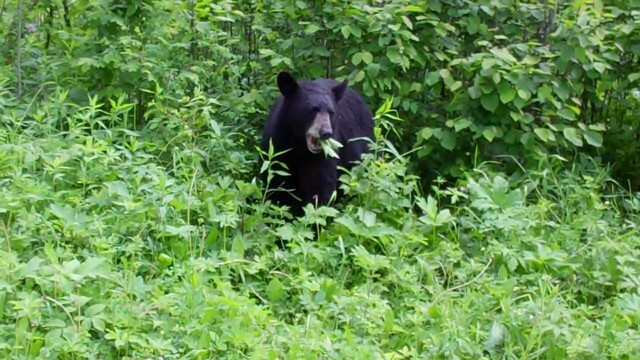 This alpha male was guarding his "brood", there were a couple of new calves as well! 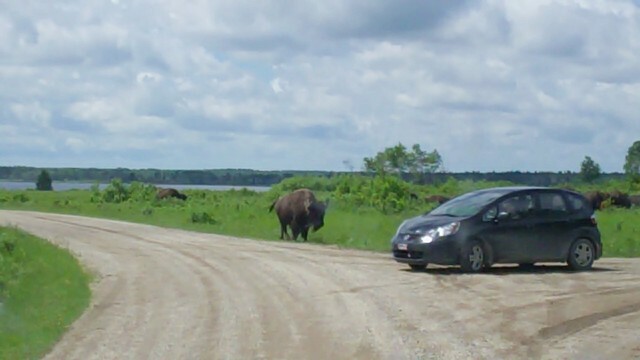 This small car from Quebec had to back up when the bull moved forward to move the danger out of the way! 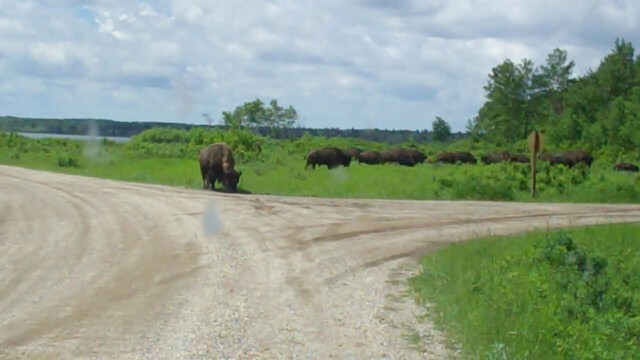 The herd had blocked the road before the bull came forward to "move" the car! It was good to leave the campsite to let it dry out while we were away. We have another full day tomorrow and we leave for Winnipeg on Friday morning! We are having an indoor day today. We've lucked out with the weather since being here, the weather forecast called for rainy weather most days but it's been sunny up to today. 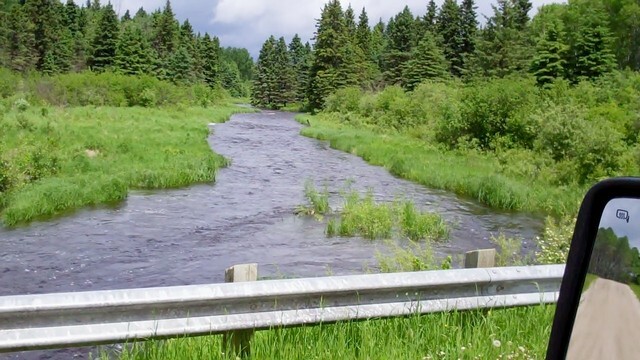 Environment Canada finally got the forecast correct, issuing a heavy rainfall warning. It rained heavily overnight with some hail and heavy rainfall is continuing with short pauses so we can take Kasey out. 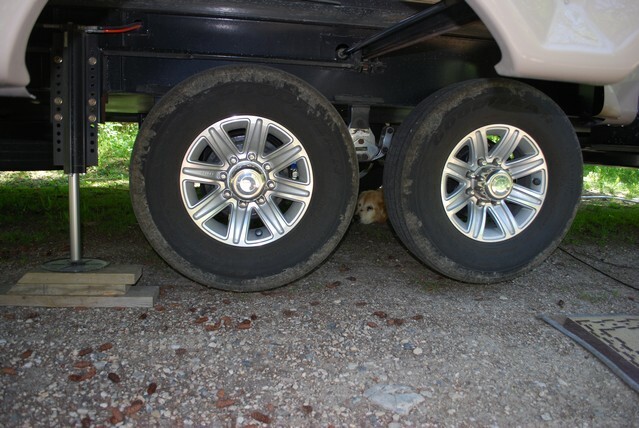 So, we are enjoying the comfort of the trailer and quickly using up the batteries on the Playbooks playing games. The sat TV is iffy at best because of the clouds and rain, it is a good forecaster of heavy rain incoming. During the week we walked around town and enjoyed a lunch at a local restaurant. We also have had a number of fires and we hope the remaining wood is dry enough to have another few once the rain stops! The weekenders have packed up and left already during the pauses in the downpour. We feel sorry for them having a washout on the only days they get off! We arrived here yesterday and we are set up for an 11 night stay. 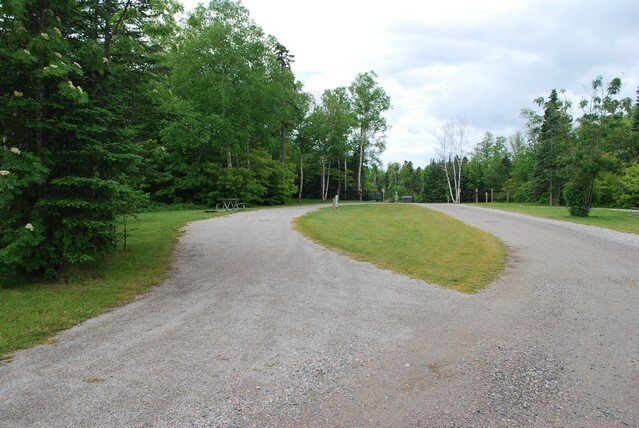 The park is quite quiet, we are one of very few campers in the serviced campground. It will get busier as the the long weekend approaches. 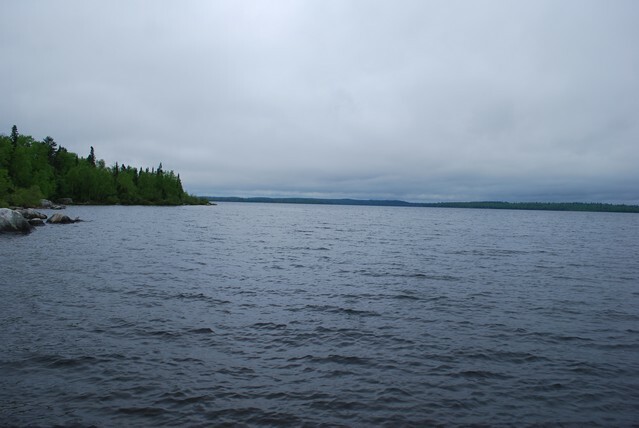 We've already sampled some take-out from the town and we've done some walking on the lake shore. We enjoy the park and look forward to the week and a half we will be here. We will post some more pictures of our stay later! 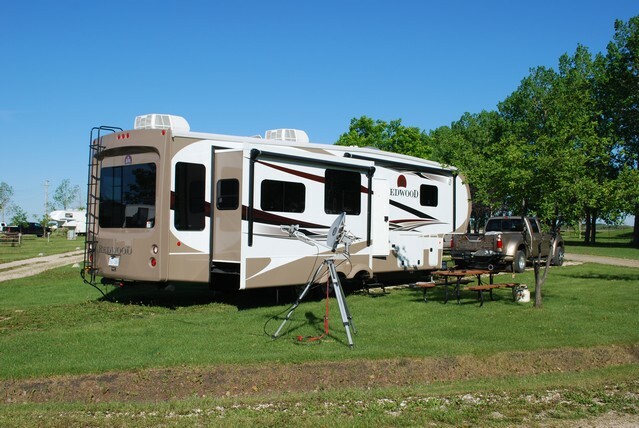 We are in Travellers RV park in east Winnipeg for the weekend, we arrived here yesterday. We have reservations at Riding mountain for tomorrow so we will do a shopping today and head out tomorrow morning. It's drier here than in previous years although we did have some rain yesterday. 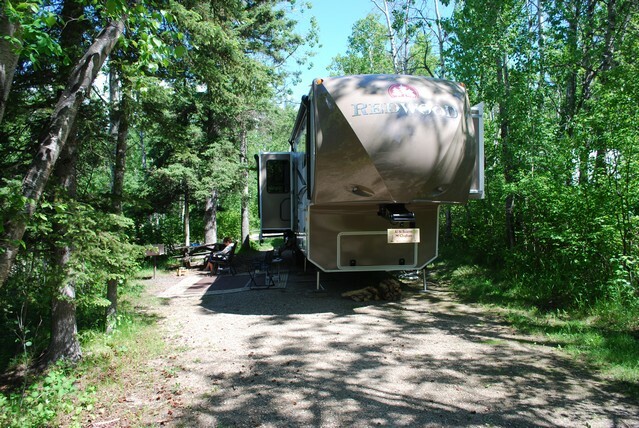 It's also a bit breezy, our campground host back in Vermilion Bay said the breeze blows all the bugs from Manitoba into Ontario! I think he is correct, not a single bug bite yesterday. We got a site that is adjacent to a ditch so we have no neighbours, and it's close eonough to the water park next door that we can watch the goings on. The water park was full yesterday. 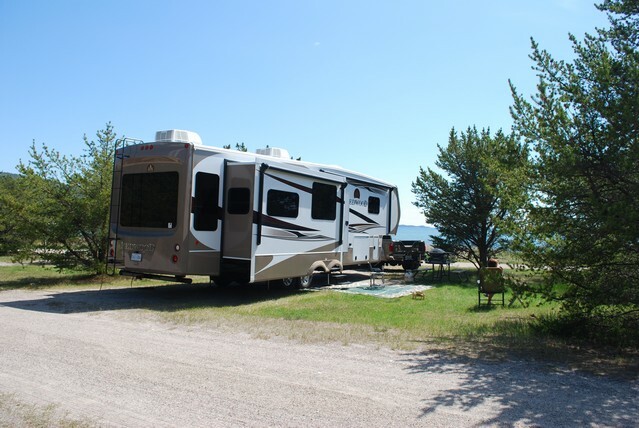 We are in Crystal Lake RV Park west of Vermilion Bay, it's a standard stop for us, it has great pull throughs and full services. 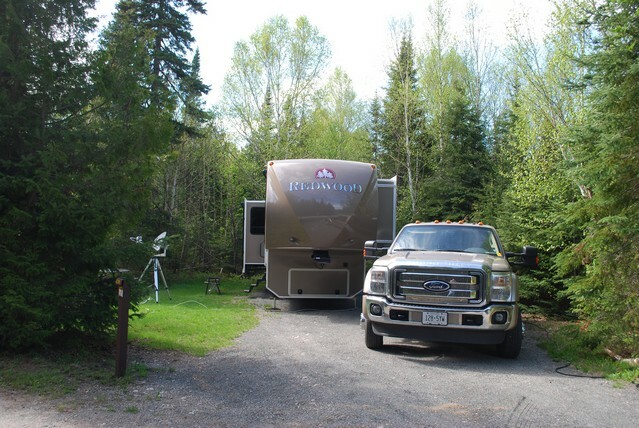 We tested the new RV's tank capacity in Ear Falls and we easily survived 3 days, using all the RV facilities including showering each morning, the tanks were still not full! 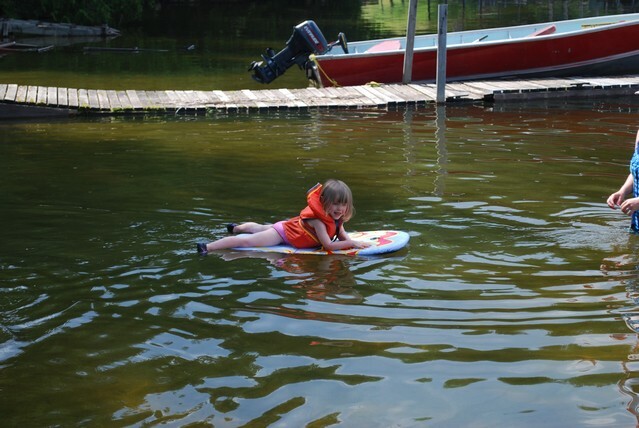 We had a great visit with our daughter and son in law for the past three days and we had lots of fun with the grand kids! 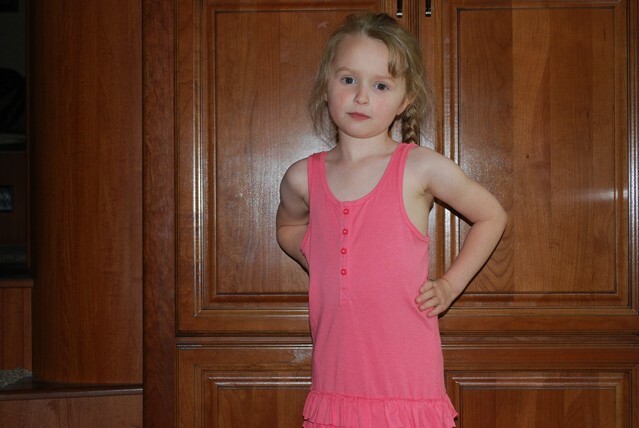 Kate has really grown up! 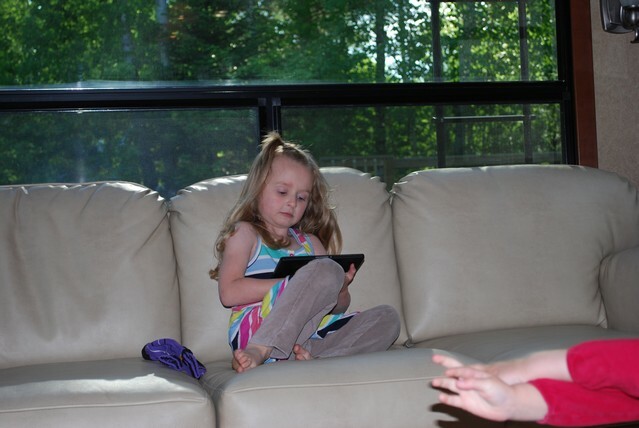 Rachelle was interested in a few of grandmother's games on the Playbook! We are off to Winnipeg tomorrow! 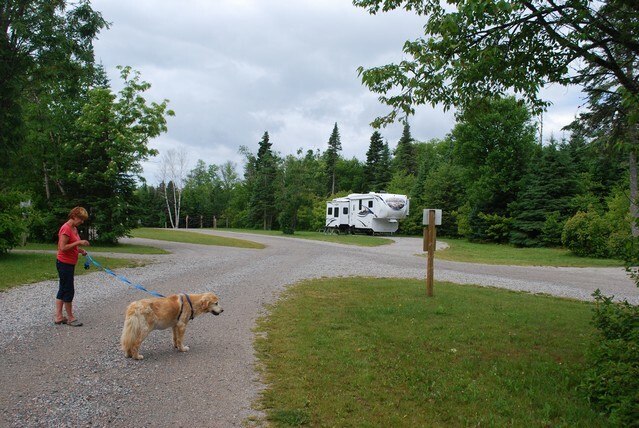 We arrived here yesterday after a 2 night stay at the Thunder Bay KOA. We did some shopping in Thunder Bay in preparation for heading west. 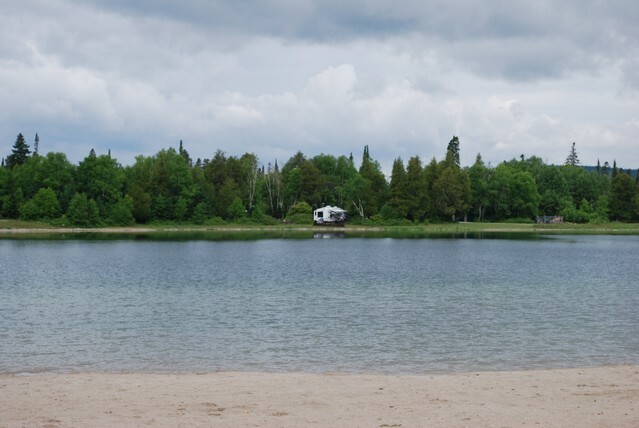 It's very quiet here in Sandbar Lake, only a few seasonal campsites are occupied. 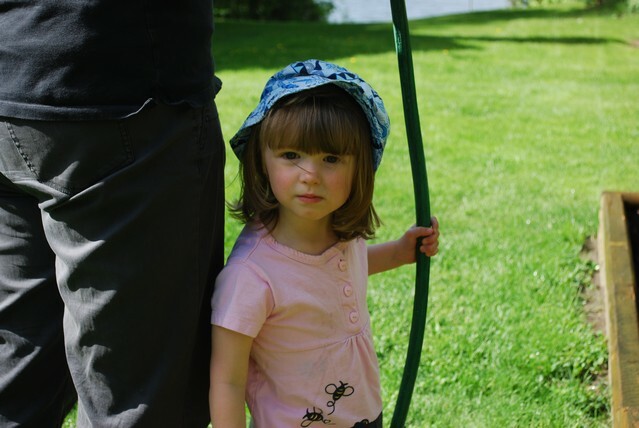 The park staff are busy getting the park ready for the summer season. We had a good day here yesterday, it was sunny and warm with few bugs, it rained overnight so it's a bit damp and overcast today but it's not raining. The weather improves as the week goes on so we are looking for more sun. 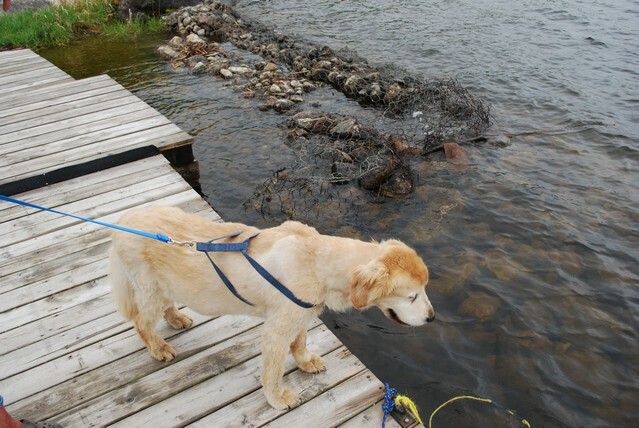 Kasey is looking longingly at the water, but with the damp weather it would take him two days to dry out! 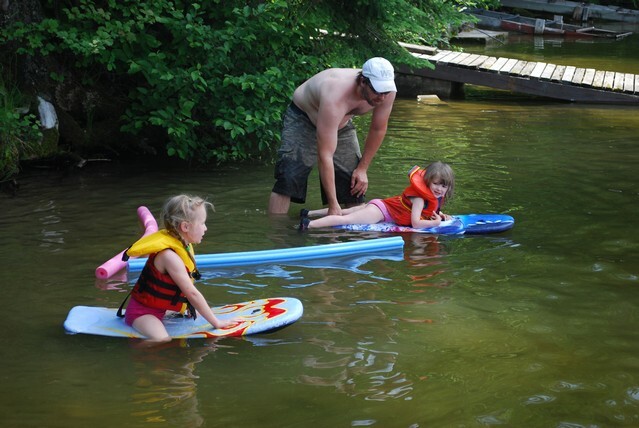 Tomorrow we are off to the Ear Falls area to visit with our daughter, son-in-law and to get our grand kids "fix"! 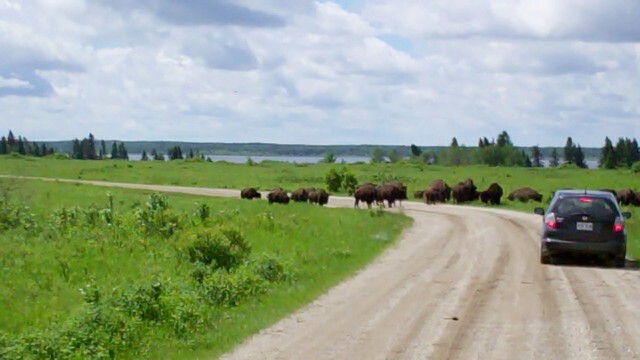 We arrived here around noon today after a shortish run from Lake Superior PP, we saw two moose on the roadside on our way here!. We are all set up and we've got some of the bugs out of the sat TV, things are looking good. Today was a good day, warm enough to stay outside but the light breeze off the lake kept the bugs away. 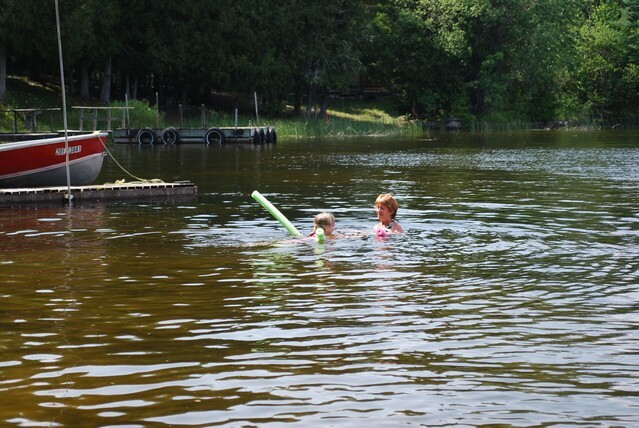 We got our normal site on the side of the lake, two beautiful days with sun and little wind. The lake was almost dead calm. 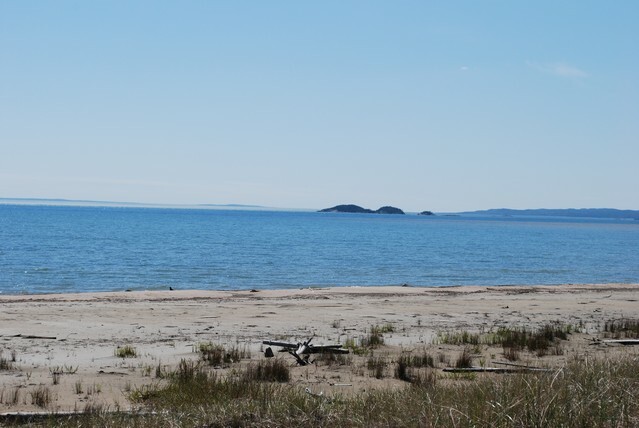 Fellow campers indicated that the islands on the distance on the left of the pictures have about 1,000 caribou on them, apparently they can swim to shore if the food runs low. Amazing! 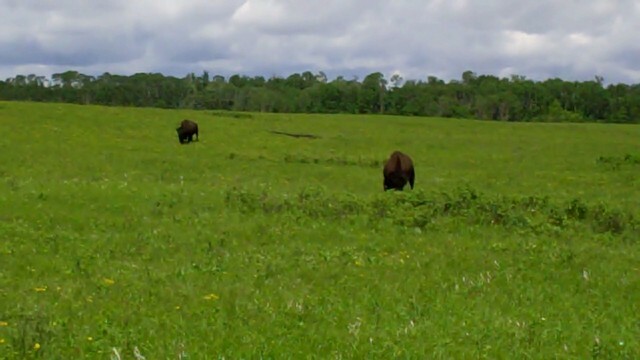 We are on the road north, we left yesterday and spent the night at Chutes Provincial Park near Massey. 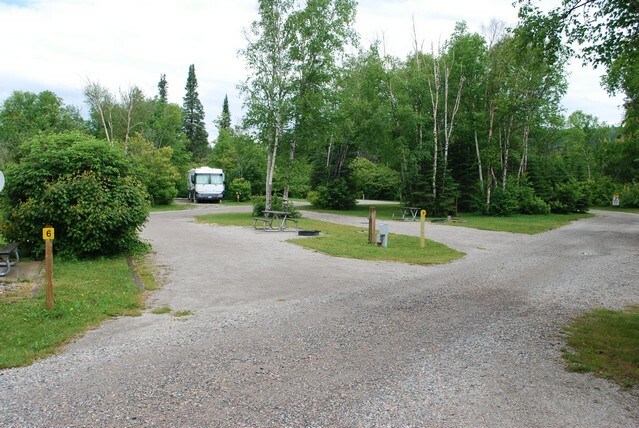 Today we are in Rabbit Blanket campground in Lake Superior Provincial Park. It's been sunny and a bit cool, the weather is helping to keep the bugs at bay somewhat. 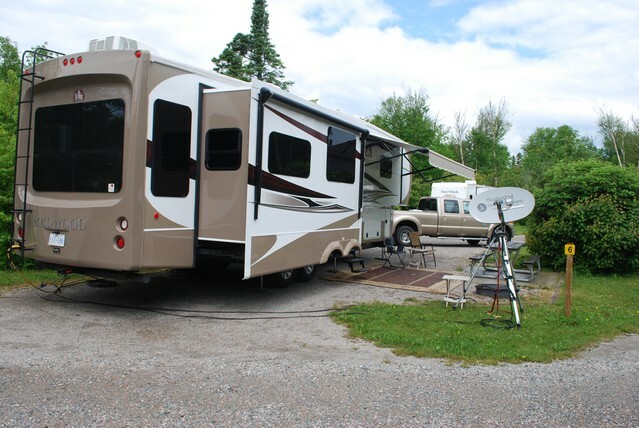 The learning process with the new RV continues, the auto leveling system has worked two stops in a row, but Al hasn't figured out how to drop the rear jacks by themselves yet (it's good to do that when the RV is parked at a rest stop and the slides have to be opened up). The sat TV isn't working yet, not sure if it's because we are in the trees and the sat is blocked or there is a problem between the Shaw box and the TV. It's time to get out the manuals!! 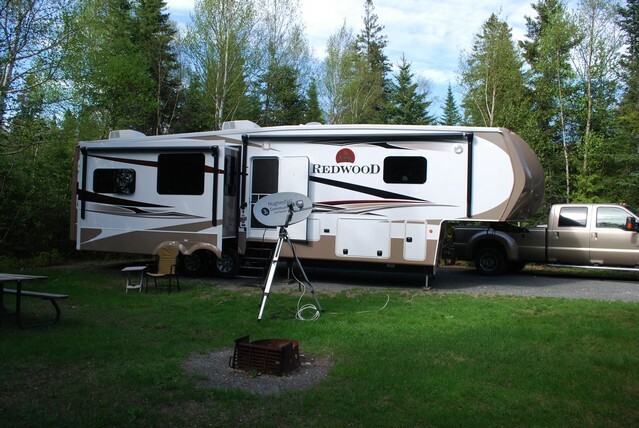 The new RV is working really well and it's very comfortable. 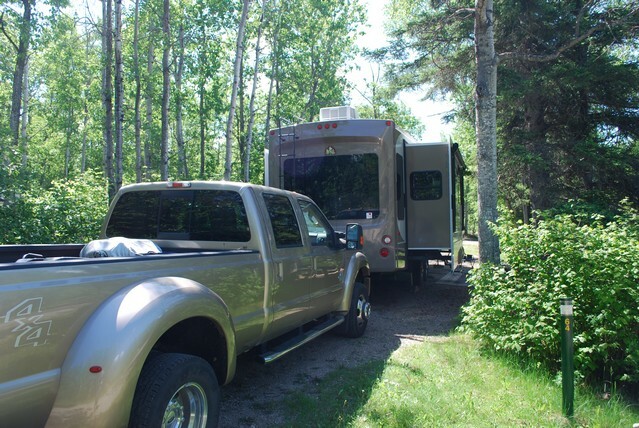 The length is a bit longer than the Titanium and that makes it a bit harder to fit into provincial park campsites but a bit of care is all that's required to fit it in. Site 29 is a great site, it's long enough for the camper and there is a straight back up because of the bend in the road. Tomorrow we head for the Marathon area. Getting ready to head north! We are getting ready to head north again! It's been a strange spring, snow and cool weather and frost last week, it's time that we tried a different venue that has (maybe!) better weather. 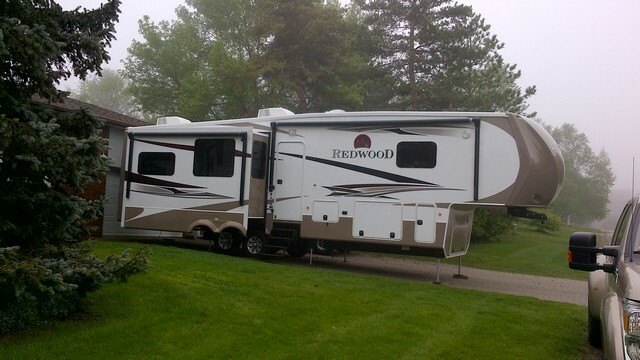 We splurged for a new camper, a Redwood 36RL, it's a couple of feet longer than our Titanium and is set up for more full time camping (better water capacity and more storage are a couple of the pluses). 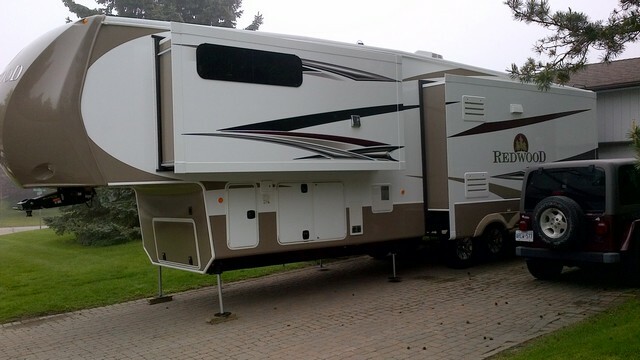 We got the camper last week and we have been madly packing it and figuring out how it works. We are sure that there will be some "adjustments" en route as we figure out where everything should stay. We leave for the north next week, looking forward to it! !